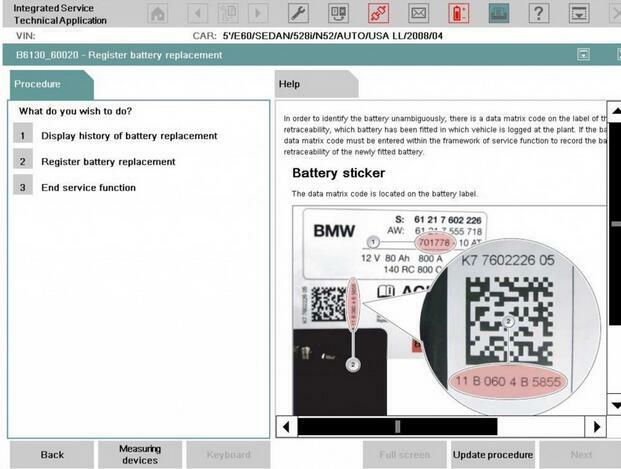 Topic: focus on why register the BMW battery replacement, BMW Battery Registration with Rheingold ISTA procedure. 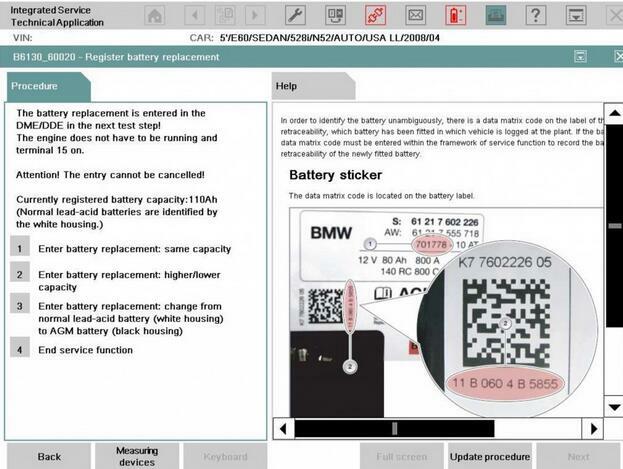 BMWs need to know when you replace the battery, battery capacity and battery type must be registered! 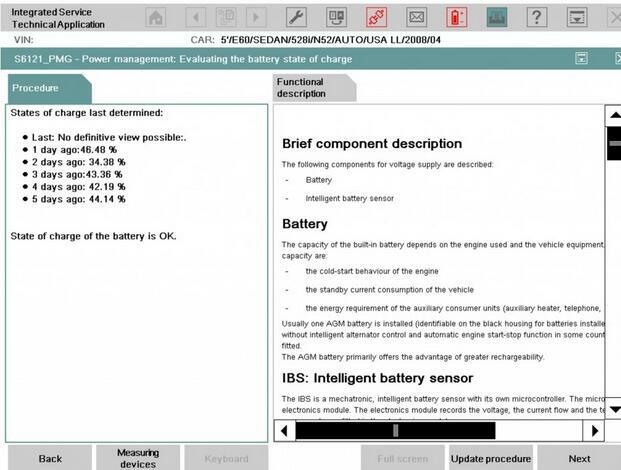 YOU DO NEED TO REGISTER battery replacements on BMWs with an IBS (Intelligent Battery Sensor). After installing a new battery, the service function ‘Register battery replacement’ must be run. 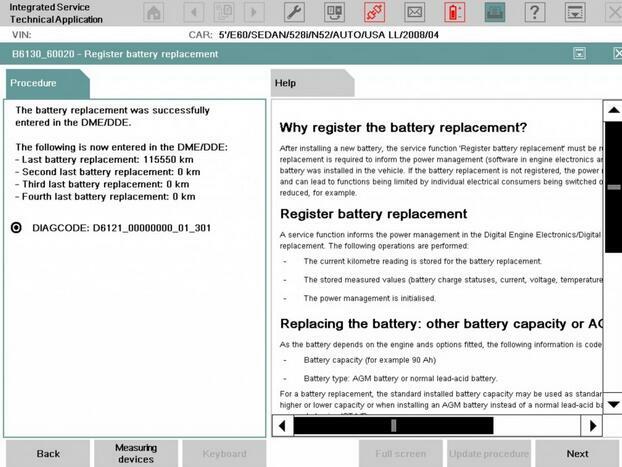 The registration of the battery replacement is required to inform the power management (BMW Diagnostic Scanner in engine electronics and intelligent battery sensor) that a new battery was installed in the vehicle. If the battery replacement is not registered, the power management will not function properly and can lead to functions being limited by individual electrical consumers being switched off or having their power consumption reduced. Power management will charge the new battery as if it’s the old worn out battery, causing premature failure of the replacement battery. Important! If the new battery is not registered, incorrect readings may appear in the display of the on-board computer due to old data in the power management system (check control message ”Recharge battery” appears even though the battery is new). -The current mileage reading is stored for the battery replacement. -The stored measured values (battery charge statuses, current, voltage, temperature, etc.) are deleted. -The power management is initialized. You’re renewing the battery with identical replacement. You register replacement to let the car know that the battery is new and the charging profile is adjusted accordingly. If you don’t the vehicle will charge for an old battery and cause premature failure. You fit an AGM in place of a Standard LA battery (or vice versa). If you don’t register the replacement then it will toast the new battery for similar reasons to Car 1 but even worse as the charging profile will be for the incorrect type battery and cause even faster battery failure. In this case you MUST use a ‘conversion’ to change the battery type. Then, register a replacement. After a battery replacement, the vehicle must be left standing for at least 3 hours with its new battery. It is not possible to establish with any reliability the state of charge of the new battery until that time. Possible Check Control messages about total discharge of the battery are then no longer displayed. The scope of application of some systems may be restricted after a power supply interruption. Likewise, individual settings may be lost. Skipping the battery registration process can dramatically shorten the life of a battery in these vehicles, be it an AGM or a conventional battery. Several issues can cause premature battery failure, see post on Energy Diagnosis, but on a late model BMW, skipping battery registration can be one of them. 10.When you have completed the above changes, collapse the registry editor back to show only the HKEY menus, then close the registry editor and restart your computer. 11. CONGRATULATIONS, your Rheingold licence is now current until 2072-09-20. Note when editing the expiration date for ISTA, you should maintain the original date format (usually YYYY MM DD) – as some packages use an BMW ICOM A2 and some use a hypenated seperator for date entry values.